One of the many ugly manifestations of Anti-Semitism has been people who identify themselves "Christians" calling Jews "Christ Killers"
This page is an attempt to seek the reality of the difficult issue of the responsibility and the guilt for the death of Jesus. We will look at it from various angles, that suggest different conclusions. 1 Some Roman legionaries - brutalised men who crucified many criminals and enemies of Rome as part of their daily duties. They had no more motive than following orders. 2 Pontius Pilate ordered the execution rather than stand up to Elders and their mob, knowing Jesus was innocent. But the rulers forced him into the decision. 4 The Jewish Elders and High priests (most of the Sanhedrin) But Jesus allowed it to happen when he could have called legions of angels to intervene. 5 Jesus' decided that he would allow it to happen, and said that was why he had come? But Jesus had to die to carry out God's plan for our salvation. 6 God - the Father - planned that this should happen. He planned Jesus' execution as the perfect sacrifice to atone for our sins. There was no other way because of man's sin. 7 It was your sin and mine that made Jesus' death necessary. We are all responsible - Jew and Gentile - man and woman. So the Jews are absolved from responsibility. Or are they? This responsibility trail only proves that we are all guilty of bringing about the death of Jesus, and nobody can stand and blame the Jews; and therefore to call Jews "Christ killers" is blind anti-Semitism. In 1965 The Vatican issued, as part of the Vatican II council, a declaration entitled Nostra Aetate, offering a new approach to the question of Jewish responsibility for the crucifixion of Jesus. 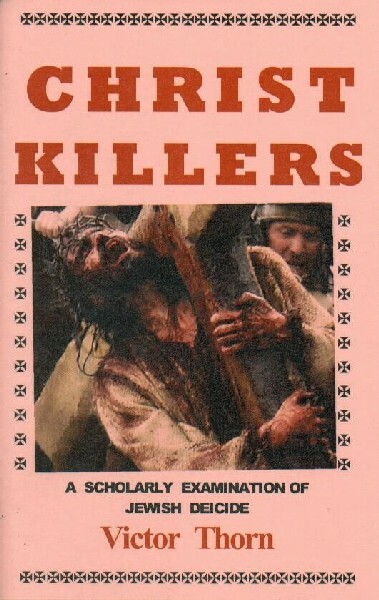 The document argued that modern-day Jews could not be held accountable for Jesus' crucifixion and that not all Jews alive at the time of the crucifixion were guilty of the crime. But is it scriptural to absolve the Jews of guilt? When Pilate saw that he was accomplishing nothing, but rather that a riot was starting, he took water, washed his hands in front of the crowd, and said, "My hands are clean of this man's blood; it's your responsibility." All the people answered, "His blood is on us and on our children!" "Fathers are not to be executed for the children, nor are children to be executed for the fathers; every person will be executed for his own sin. It might be interesting to ponder the significance of having Jesus' blood on one's head, since it is the blood of Jesus that makes us clean - justified. But I am inclined to believe that the mob spoke of blood in respect of responsibility and not of cleansing; condemnation not atonement. Yeshua said, "Father, forgive them; they don't understand what they are doing." Peter (a Jew) had no doubt that his (Jewish) audience had killed the author of life. The God of Avraham, Yitz'chak and Ya`akov, the God of our fathers, has glorified his servant Yeshua - the same Yeshua you handed over and disowned before Pilate, even after he had decided to release him. You denied the holy and innocent one, and instead asked for the reprieve of a murderer! You killed the author of life! "But God has raised him from the dead! Of this we are witnesses. "Now, brothers, I know that you did not understand the significance of what you were doing; neither did your leaders. But this is how God fulfilled what he had announced in advance, when he spoke through all the prophets, namely, that his Messiah was to die. "Therefore, repent and turn to God, so that your sins may be erased; so that times of refreshing may come from the Lord's presence; and he may send the Messiah appointed in advance for you, that is, Yeshua. The Jews were not forever rejected by God, but were offered forgiveness for whatever part they had in the death of Jesus, and for every other sin. This is exactly our position as Gentiles! Here is a more difficult concept. he has said, "It is not enough that you are merely my servant to raise up the tribes of Ya`akov and restore the offspring of Isra'el. I will also make you a light to the nations, so my salvation can spread to the ends of the earth." Indeed, the Bible tells us that Jesus was crucified at the third hour (9:00 am) and that he died at the ninth hour (3:00 pm) having cried out, "it is finished." Jewish writings tell that the slaughter of passover lambs commenced at 9:00 am and finished at 3:00 pm, when the High Priest would hold out his arms and say "It is finished" (Hebrew tam v'nishlam). These two sacrifices were carried out at the same time and less that a mile apart. At the same time as the religious leaders were killing "the author of life" (Acts 3:15) they were carrying out God's purposes. If this had not happened, we would all be dead in our sins! Responsibility for doing evil that needs to be done. This raises difficult questions, such as, "If God used Judas to betray Jesus, why was he condemned?" For the Tanakh says to Pharaoh, "It is for this very reason that I raised you up, so that in connection with you I might demonstrate my power, so that my name might be known throughout the world." So then, he has mercy on whom he wants, and he hardens whom he wants. They were at supper, and the Adversary had already put the desire to betray him into the heart of Y'hudah Ben-Shim`on from K'riot. So where do the Jews stand now? When Peter challenged the crowds of Jews with their guilt, they asked "What must we do to be saved?" he preached that they must repent and trust in God's salvation - Yeshua - Jesus. And thousands of Jews did just that, in Jerusalem and around the known world. The church, the body of Messiah Jesus, was almost entirely made up of Jews who were saved and forgiven of all sins, including the killing of Jesus. Kefa (Peter) was still saying these things when the Ruach HaKodesh fell on all who were hearing the message (Gentiles). See also the early chapters of Ephesians and most especially Romans nine through eleven. Unfortunately, what Paul (Sha'ul) feared came to pass and the Gentiles made the church non Jew-friendly. At the same time the (non-believing) Jews moved in the opposite direction as their leaders tried to make sense of life without Jerusalem, the Temple and sacrifices. They developed Rabbinic Judaism with good works (Mitzvot) replacing (or failing to replace) sacrifices for atonement. This drift apart, and the persecution which the two factions practised upon each other, as and when they were able, made the gulf that Jews had to cross to find salvation in their Messiah almost impossibly wide. Jews who believed in Yeshua as their Messiah almost disappeared down the centuries, with those who did believe having to become Gentile Christians and be cut off from their Jewish identity and family. There was a large Jewish revival in Eastern Europe before WWII - what we would call today Messianic Judaism - but those believers all perished in the Holocaust. Satan snuffed out the movement. The modern Messianic Jewish movement (of God) restarted roughly concurrently with the rebirth of the nation of Israel, and has now grown to a significantly large body - both in Israel and in the Diaspora. The existence of this body of Jews who have salvation, as we Christians recognise it in the scriptures, points to the fact that the main body of Jews that do not accept Yeshua from Nazareth as their Messiah and have no other acceptable atonement have a problem and are not forgiven of their sins. John 14:6 Yeshua said, "I AM the Way - and the Truth and the Life; no one comes to the Father except through me. Thus it is not permissible for followers of Jesus/Yeshua to say the Jews don't need the New Covenant as they have all they need in the earlier covenants. That is Dual Covenant Theology and it withholds the gospel from the Jews, if we tell them the easy message instead of the truth as Peter told it. Act 3:17 "Now, brothers, I know that you did not understand the significance of what you were doing; neither did your leaders. But this is how God fulfilled what he had announced in advance, when he spoke through all the prophets, namely, that his Messiah was to die. "Therefore, repent and turn to God, so that your sins may be erased; so that times of refreshing may come from the Lord's presence; and he may send the Messiah appointed in advance for you, that is, Yeshua. He has to remain in heaven until the time comes for restoring everything, as God said long ago, when he spoke through the holy prophets. Look again at the issue of hardening hearts. It is that stoniness, to a degree, has come upon Isra'el, until the Gentile world enters in its fullness; and that it is in this way that all Isra'el will be saved. Moreover, if their stumbling is bringing riches to the world - that is, if Isra'el's being placed temporarily in a condition less favored than that of the Gentiles is bringing riches to the latter - how much greater riches will Isra'el in its fullness bring them! But has the stoniness needed to send the gospel to the gentiles been made worse than it needed to be by the actions and attitudes of both Jews and Christians? Rabbinic Judaism teaches a derogatory picture of Yeshua / the Christian Jesus. The Church/Christendom has further hardened Jewish hearts with Blood Libels, Expulsions, Inquisitions, Pogroms and the Holocaust. The church should be studying, very seriously, Paul's teaching in Romans 9 to 11 but it is almost completely ignored. If we had grasped what Paul was seeking to teach, we would see that the Jews' rejection of their Messiah was necessary for our, Gentile, salvation and that the disadvantage this placed them under will be rectified. We were never given a mandate to excuse the Jews, and certainly not to condemn and punish them! ".....in the hope that somehow I may provoke some of my own people to jealousy and save some of them! " We don't even call Jesus by his Hebrew name (Yeshua), so his Jewish identity is hidden from Jews! This is the burden of wildolive and many other movements. Malcolm Hedding, when he was the head of the International Christian Embassy Jerusalem remarked that the first - main - mission was the removal of the stumbling blocks that have been placed in the way of Jews and Israelis finding their Messiah. The ICEJ has been remarkably effective in changing Israeli public perception through demonstrating the love of Yeshua in practical ways. The thousands of Christian Zionists who support the work of ICEJ and join in expressing that love every year during the Feast of Tabernacles celebration and Jerusalem March are also part of that healing process. But Gentile Christians anywhere in the world may have chances to touch Jewish hearts where they meet them, if they have grasped Paul's message to the Romans and realised that they are "Grafted in." The conclusion of all these arguments is that we must not be judging and condemning Jews, and certainly not persecuting them as "Christ Killers", but interceding for them. We must be working towards the softening of their hearts and presenting a true picture of Yeshua their Messiah in place of the Gentile Jesus whose followers have caused so much pain to Jews down the centuries.